The Garden Plot: Drinking & Gardening? What to do with those empty wine bottles! Drinking & Gardening? What to do with those empty wine bottles! 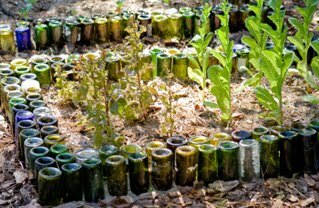 We loves these"Ten Surprising Ways to Reuse Wine Bottles in Your Garden" from author Ronnie Citron-Fink on PlanetGreen. Of course, the king of bottle reuse is Felder Rushing (that's not to insinuate that he drinks a lot of wine!) 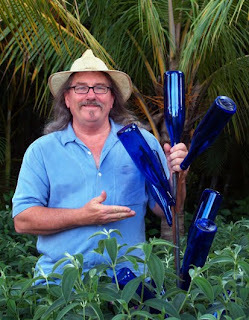 so be sure to check out Felder Rushing's blog for lots of bottle tree examples that are easy to do yourself. "After you have fun emptying your wine bottles, instead of trashing or recycling them, try these DIY projects. "According to A Recycling Revolution, every year we throw out enough glass bottles and jars to fill a giant skyscraper. The energy that could be saved from recycling one glass bottle could provide 20% less air pollution and 50% less water pollution. One glass wine bottle takes 4,000 years or more to decompose - longer if it sits in a landfill. Ouch! "When you haul your wine bottles to the recycling center, what happens to all that glass? Much of it goes into making more glass bottles. The glass gets broken up into smaller pieces called cullet and used to make more glass.
" If your recycling bin overfloweth with too many wine bottles, you probably should take a long hard look at your drinking habits, and then go out and assess how you can put those bottles to good use in your garden. Those sturdy colorful bottles provide the perfect material for upcycled projects for your garden." Be sure to check out the whole story and other ideas on PlanetGreen, a blog from the Discovery Channel. Now I'm off for a little vino in the garden so I can start one of these cool projects! Upended wine bottles are actually used often in France as garden edging. I've seen them in country gardens as well as hotel potagers...it's a great idea. Amazing to see Glass Planters on these picture, although I like Hand Blown Glass Bottles! I think this type of glass bottles make your garden more beautiful. My garden needs them. By the way, guys, thank you so much for sharing this post with the awesome picture. The water dispenser is very important for every event because this dispenser provides your guest a n clean & cool drinking water. But in some royal and luxurious events the people use the Custom Glass Dispensers for providing water to their guest, because these glass dispensers are looking very unique and beautiful and matched wCustom Glass Dispencersith their decoration theme.